Clear the risk of damages to your camcorder using the Working Easy Hard Protection System.By now the risk of damages to your video equipment and accessories even during The hardest conditions are totally cleared by the Working Easy Hard Protection System.Working Easy Hard Protection System includes a Wheeled Hard Resin shell, a lightweight, waterproof, unbreakable case which meets ATA 300 specifications for transit cases and a padded Working Easy case which comes inside. 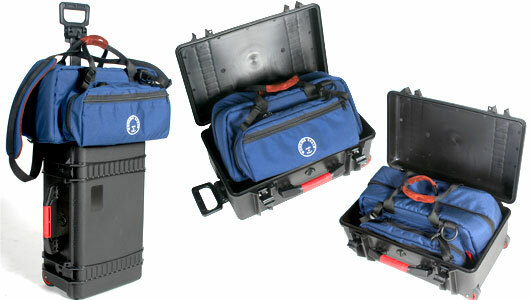 The Shell is provided by an Air pressure release valve and Neoprene O-rings keep the cases airtight and watertight. Keep you equipment protected by impacts, water, dust, corrosion for chemical agents by the shell and, once to the working destination, take off the shell and work comfortably and easily with the Working Easy case.